Encouraged with the outcome of latest earth dipole tests I decided to continue testing of those interesting antennas. 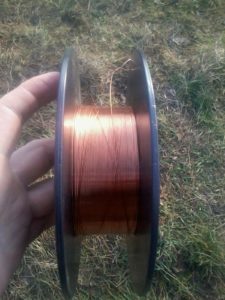 I used a 0.6 mm copper plated steel pole (due to cost and no alternatives available). Resistance for the pole was over 1kOhm. The cord was spread across the field lying on the grass or in the bushes at the height of 0 – 2 meters above the ground level.